Had an interesting movie experience on Friday: In the morning, I watched “The Taking of Pelham 123” at a screening at Pacific Place; in the afternoon, I watched the 1974 original, “The Taking of Pelham One Two Three” (no idea why they spelled it that way), on my TV at home. (Comcast subscribers: It’s currently in the “Free Movies” section of the on-demand cable, if you want to check it out.) It’s rare that I watch an original and a remake in such immediate proximity, and it caused some musings . . .
— This should be obvious, but it isn’t so I’ll say it: Watching a movie in a theater is just so much better. I wish I’d had time to catch “Pelham” on screen at NWFF while they were running it earlier this month. Sitting in the dark, free of all those home distractions (the ringing phone, the friendly cat, the other person asking questions about laundry and groceries), you can lose yourself in the story and action. I know the multiplexes have their problems — in fact, I ranted about them just last week — but there’s nothing like an enormous screen and a bag of popcorn. — Both movies have essentially the same basic plot, in which a team of men hijack a New York subway train and demand a vast sum of money ($1 million in 1974; $10 million in 2009) to be delivered within an hour — or they start killing passengers. But the 1974 “Pelham” is very funny, right down to a terrific final punchline that’s basically a big Walter Matthau close-up. The 2009 “Pelham” isn’t funny at all, and isn’t meant to be. Things have happened in the intervening years, and it’s no longer OK to have jokes in a movie about hostages. Pity; I loved the crusty transit employee in the original film who muttered “Screw the goddamn passengers! What the hell did they expect for their lousy 35 cents – to live forever? — Both movies are rated R, primarily for violence and language. But the 2009 version is much, more more violent, with bodies and blood and gruesome up-close shootings. The 1974 version feels tame by comparison; in fact, its few shootings seem to happen without blood. — Walter Matthau, who plays the transit cop at the center of the hostage drama, was 53 at the time of the film. 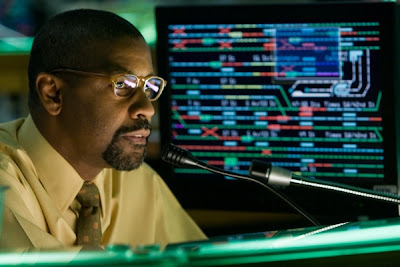 Denzel Washington, who plays the transit employee (a slight change) at the center of the drama in the new film, is 54. Matthau, in the film, is very, very middle-aged and unglamorous. Washington, though there’s an attempt to frump him up with a sweater vest and glasses, looks like a movie star and seems much younger than Matthau’s character. Likewise for John Travolta’s gunman, who dresses as if he’s a generation younger; while the hijackers in the original film blend in by wearing bow ties and tweed coats. Middle age, it seems, has changed somewhat since the ’70s. — Which movie did I like better? Have to say, the original, though there’s much to like in the new film. See my review Friday for details, but do watch both for yourself and see what you think. And I’d love to hear from anyone who remembers seeing the original “Pelham” in theaters. Does this man look like Walter Matthau? Denzel Washington in “The Taking of Pelham 1 2 3” (photo by Stephen Vaughan; copyright 2009 Columbia Tristar Marketing Group).